The letter representing the unit displayed will be appended to the end of the amount. The default behavior of du shows the totals for directories and not individual files. The -a or –all switch will report counts for all directories and files recursively. This will display the usage for each file and then a total for all three files on the last line all in human readable units. If just `du somedir` was run. Recursion depth can be controlled with the -d or –max-depth= flag. If you specify 0 as the depth this is the same as -s or –summarize. What this does is control what displayed, it does no alter the values. The list of values will only display a recursion up to the max depth. That is, if a max depth of 1 is specified it will only show the current directory and one level of subdirectories but it will report the usage values normally. If you have a directory that contains a child directory which has two child directories underneath it, only the first child directory will be reported in the output instead of all first child directory and then an entry for each directory under the child. But in either case, the total usage for the child directory will be reported as the same and the toal usage over all will be the same. The output of du is a list with each entry separated by a new line. You can change the newline to a 0 byte using the -0 or –null option and this will output the values on a single line separated by a 0 byte. Be aware of these difference when comparing the output of du with the results of other applications like ls or wc. The du command has options for handling hard and symbolic links. By default du will not count multiple instances of a hard link and it will not dereference, or follow, symbolic link(s). The latter option is -P (or –no-dereference), but as it is the default, you probably will not need to use this flag. If you want to include symbolic links use the -L or –dereference flag, du will then follow symbolic links to their original files and include them in the value. The -l or –count-links option will count multiple instances of a hard link each time an instance is encountered. If you had three hard links to a file du would only count this as one for original file hard linked to. With the -l flag each hard link would be counted in the total, and in this case would include those 3 hard links in the usage. The first column reports reports the block device or filesystem. Entries for for block devices are pretty straight forward. /dev/sda# is the first scsi-drive partition #. The filesystem entries may not be so evident. rootfs is a special instance of ramfs (used for page cache and dentry cache). shm – tmpfs partition used for shared memory, passing data between programs. For more information on those filesystems, consult the links below. The next three columns report the size of the filesystem, how storage is used, and how much is available in the specified format (1 kilobyte blocks by default). Use% show the percentage of storage used and the final column indicates where the filesystem is mounted. Notice that a few more filesystems show up here than before: proc, sys, devpts, binfmt, none (usbfs), and gvfs-fuse-daemon. gvfs-fuse-daemon: The userspace filesystem used by gnome. Some versions of df may support the -h or –human-readable switch. This will display the values of total blocks, Used, and Available using the smalled three digit value and block size possible. That is, instead of 1024 Kilobytes df -h would display 1 Megabyte. There is also a human readable option for 1000 byte blocks which is specified by the -H or –si switch. Will show the inode information of the system in the human readable format. By default df will show ALL mounted filesystems, even remote filesystems. The -l or –local switch restricts df to only showing local filesystems. The –no-sync options is the default mode for df which does not perform a sync operation on the filesystems before reporting value. Therefore, if you have a mass storage device or content that has not been written to a disk, the df command man not reflect this information. A sync can be forced by issuing the –sync switch, although be prepared, in some cases it may take a while to sync the filesystems before the values can be reported. The –total switch provides a total on the last line of each column’s values where relevant. The w command show who is currently logged in to the system and from where. As Linux gains more and more desktop usage one might wonder how useful this command could be in an environment that particularly caters to a one person per use system. While w is critical in a server environment where you may have multiple system administrators performing various functions and a need to know who may be working on the machine before bringing down the server or a service, w still manages to display some very crucial information that is also valuable to the single desktop user environment. 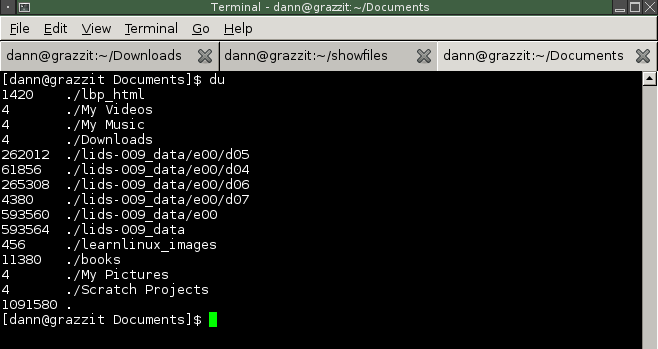 Command line of the current process: xinit ….. The header information is pretty straight forward except for load average. Load average is a very useful metric and appears not only in this command but also in top (which we will be covering in a future episode). Load average is broken into 3 values: Past 1 minute, past 5 minutes, and past 15 minutes. What this average relates is how often processes are waiting for CPU time. Load average is often explained using a traffic analogy where the cpu is the highway and the load average is a value representing the cars waiting to get on the highway from an on ramp. When there are no cars on the on ramp, that means there is no backup and processes are not having to wait for cpu time. As CPU utilization increases more cars start to backup on the on ramp and thus load average increases. The more cars that are backed up, the greater the load average and the longer processes have to wait for CPU time. Ideally load average should be below 1.0 per processor. If your load average is exactly 1 that means the cpu is running at full capacity with no processes waiting. Above 1 could indicate a problem and processes are having to wait for cpu time. Be careful with how you interpret load averages, you cannot just rely on the load average of the past minute to indicate whether there is a problem or not. Hence the reason the past 5 minutes and past 15 minutes are also represented. The latter two values provide more of a current profile that just the past minute. This allows you to observe the performance of your system over a short period of time and can weed out false alarms. Lets say you started a game or were compiling a program and saw your load average spike to over 1.35 the past minute. Chances are your 5 and 15 minute averages saw a more modest bump in load averages but nothing to indicate there is a probelm, after all you ran a pretty intensive task. On the other hand, if you start seeing values over .70 in two or more of these columns over time, you may want to start ferreting out the culprit as this is a pretty good indication there is a problem. Again, be aware of what is going on. If you are rendering a movie, this may be normal load averages for such an intensive task. But if you are running a web server this could indicate your system resources are getting close to being taxed and you may want to start beefing up your machine. Note that the emphasis was placed on 1 processor. Many systems run more than one processor or have multiple cores per processor. These extra processors need to be taken into account when observing load averages. Thus the traffic analogy continues and we can equate each processor to a lane of traffic. So now in a dual core system where you have the equivalent of 2 processors, a load average of 1 is not alarming. A load average of 1.7 should start to raise eyebrows and a load average of 2 means both processors are running processes to the max. Getting over 2.15 means you probably need to start paying attention to what is going on. Should this trend continue over a period of time and start to grow, you need to fix the problem fast. To summarize with another way to look at load averages, if the load average is under 1.0 that means your processor is more than capable of handling the load you have been putting on it. At 1.0 means your CPU is maxed but handling the load as necessary. A load average of 2 means that ideally you would need at least twice the cpu capacity to handle the load average your system has been experiencing. At 5.0 you are 5 times above our CPU’s capacity. Again, this is a very rough analogy, not completely accurate, but close enough to give you and idea of what to look out for. There are a few switches you can pass to the w command. The -h or –no-header option will display only the users and process information. The -s or –short displays only the header, users and processes. It omits the JCPU and PCPU information. Will show only the processes pertaining to the username specified. The header will remain unaltered. In most cases -c and -m will produces the same output unless you are working in a multi-byte characters set and using multi-byte characters. If you read the info command for wc you will see an example of using the –files0-from= switch with the find command. The tr command has “translated” each character in set one ‘1 2 3 4’ to its corresponding character in set 2 ‘a p l e’ and produced the word “apple” to standard out. Take note that unlike in other programs or applications a range is not specified withing brackets (i.e. ; [1-4[). Placing a range within brackets may not produce the desired results. Results in the output: “hello hooray let the show begin” where the “-” is replaced by ” ” a single space. Since there is no ‘5’ from standard in there will be no resulting translation of “5” and thus no “s” will appear in standard out. In this example if you were running the BSD version of tar the resulting output would be ‘abccc’ where the last character in set 2 was repeated until it matched the number of characters in set 1. 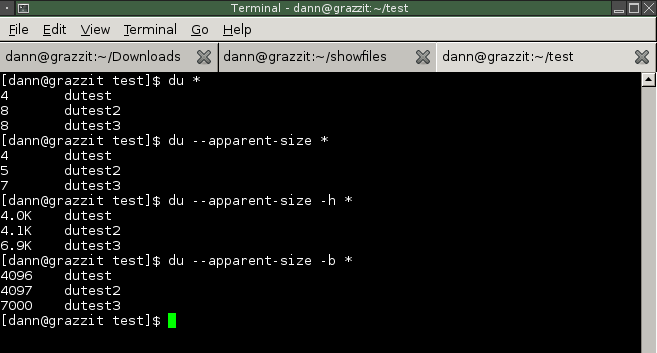 In the system V version of tr would truncate set 1 to the lenght of set 2 and the output would be ‘abc45.’ GNU tr handles these cases like BSD tr unless the -t (truncate set 1) flag is used. Defined classes can be used instead of specifying individual characters in a set. For example, the set of all characters in the english alphabet can be defined by the class [:alpha:] and the set of all numbers 0-9 is defined by the class [:digits:]. Results in: ‘appleccc!’ Notice an exclamation point was tacked on the end there. That is not in the [:alpha:] nor [:digig:] classes. You might wonder why the 345 was converted to only 3 ‘c’s’. Recall that in GNU tr like BSD tr set2 will repeat the last character to expand to set 1. So 0 = a, 1 = b, and 2 through 9 = c.
In most cases character classes [:lower:] and [:upper:] are the only two classes allowed in set 2 so long as their corresponding class is used respectively as set 1 (e.g. : tr [:upper:] [:lower:]). The exception to this rule is when using the –delete or —squeeze-repeats option (covered shortly). Would produce the output: ‘abc456’ where as without the -t flag the output would be ‘abcccc’ as ‘456’ in set 1 would be matched to the ‘c’ in set 2. Both produce the same output: ‘apple’ stripping the numbers ‘123’ and ’45’ from the output. The squeeze, -s, flag is used to replace repeating characters specified in set 1 if no translation or deletion is to occur. If translation or deletion is to occur then set 2 is used and squeeze occurs after the translation or deletion of characters specified in set 1. In this example tr would replace any repeating instances of a, p, or 5 with a single instance of the respective character. The result is ‘aple12345p’ where the second ‘p’ and second ‘5’ were “squeezed” out but not the first and only occurrence of ‘a” as that is merely a single character. The last ‘p’ is not stripped out because it occurs only by itself. The output of tr is: ‘sssssapple’ replacing all the characters not in the [:alpha:] set with ‘s’ – ‘12345’. The characters ‘apple’ are ignored because they are in the [:alpha:] set. This example makes use of the –complement and –squeeze flags. Standard in is the file somefile.txt and that is passed to the tr command. The tr command first takes the complement of set 1 [:alpha:] which is all digits, spaces, punctuation, etc; characters that are not in the alphabet (a-z) and replaces them with the \n, or newline character. The asterisk is required in set 2 to repeat the \n in set 2 so the length equals that of set 1. The –squeeze option then squeezes out extra \n’s in the output so that there is only one newline after each word. Recall that when –squeeze is used in conjunction with another flag, the set 1 is processed by the first flag and –squeeze uses the values in set 2. The result is a list of words or letters to standard out. The !, 10, ., and each space was stripped out and replaced with a newline character. For more on the tr command consult the links below and also be sure to check out the man and info pages on your current system.